Wildflower honey produced from urban gardens is a gourmet's delight! While it is hard to meet the criteria for "certified" organic honey, you can manage your bees and produce wonderful honey with a minimal reliance on chemicals using Integrated Pest Management. Producing honey that can be certified "organic" is not easy because the national standards for organic production are very strict. The standards for organic production for apiculture can be found here in section 7.1 of the General Principles and Management Standards for Organic Production. Location: Restrictions exist for where the hives may be located. They must be more than 2 km (distance varies with different standards) from GM crops or any area treated by pesticides. 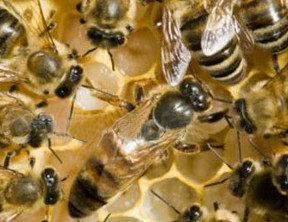 Management of bees: Diseases and pests must be treated with approved products (eg oxalic acid, formic acid). Antibiotics are not approved for organic certification. Management of honey: Regulations specify the temperature for heating honey (typically it should not be heated above 42 degrees C) to protect the enzymes and antimicrobial property of organically produced honey.